Arequipa is located in the foothills of the Western Andes. It is surrounded by spectacular volcanoes, the most famous of which, Misti Volcano (5821 m), is a symbol of the city that can be clearly seen from Llama Education, and is flanked by two other volcanoes: Chachani volcano (6075 m) and Pichupichu Volcano (5425 m). Arequipa is known as “the White City” because the white colour of the sillar (a volcanic stone used in many colonial buildings). It is the capital of the present-day Department of Arequipa, founded by the Spaniard Garcí Manuel de Carbajal on 15 August 1540. The originality and variety of the landscapes (impressive volcanoes, terraces, valleys and canyons), pre-Hispanic traditions and art, the mild climate, the great food and the impressive ecclesiastical as well as civil colonial heritage, make the city and its surrounding regions one of the most attractive touristic centres in Peru. The urban layout of the city follows the traditional square pattern which the Spanish introduced to America, organised around the Plaza de Armas from where the main roads begin. The colonial buildings in the city were initially made of adobe and straw which were destroyed by an earthquake which affected this region in the seventeenth century. The reconstruction of ancient buildings, as well as the construction of new ones, was performed with white volcanic rocks referred to as sillar (ashlar), which is very common in the area due to the eruptions of the enormous volcanoes surrounding Arequipa. The malleability of the volcanic material provided the builders in the region with dense, abundant decoration for the façades of the buildings. The city contains several monuments from its colonial past: convents, churches, monasteries and large private homes, all of which are a clear reflection of the Spanish presence. However, the city also reveals evidence of its original mestizo influence and mestizo Baroque art. In 2000, its centre was inscribed in UNESCO’s World Heritage List on account of its beauty and harmonious mingling of European and indigenous architectural traditions. As one of South America’s safest and most attractive cities with 300 days of sunshine a year, Arequipa is an excellent place to study Spanish. 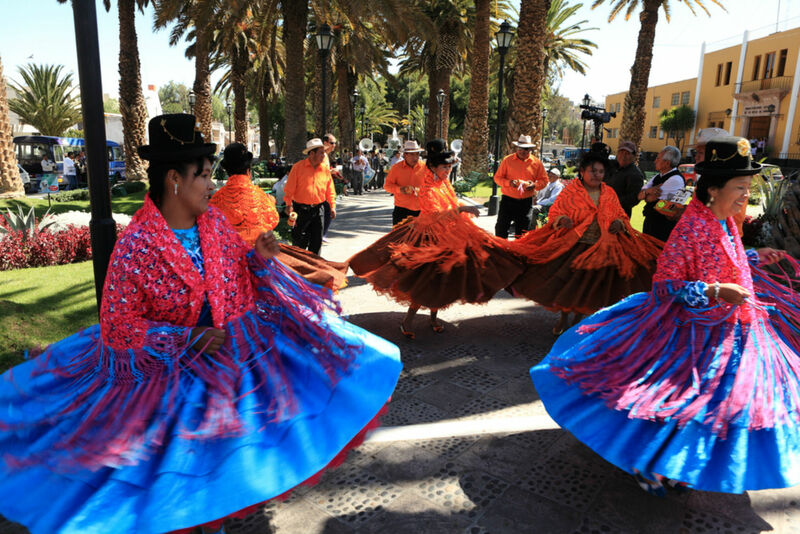 Peruvian Spanish is among the clearest and easiest to understand in the Americas and many Peruvians consider the country’s best Spanish to be spoken in Arequipa. As an important commercial and cultural centre, Arequipa offers students the opportunity to practice Spanish in a variety of settings. In addition, Arequipa is well located for students who wish to continue their travels to the Sacred Valley and Puno, or to Bolivia and Chile. Unfortunately, some parts of South America have gained a bad reputation in the media where safety is concerned. While it is true that there are some parts of cities in Peru that are as dangerous as the worst parts of New York, London or Amsterdam, crime is limited for the most part to minor robbery and pick pocketing and there is little threat of any violence. By taking sensible precautions, adverse situations can be avoided. Arequipa is generally a very safe city for students to walk around alone. During the introductory “getting to know each other” day, Llama Education provides a full briefing on how to avoid any safety issues. However, should an incident occur, there is always a 24-hour support service available from Maria. This support is also available for any health issues that may arise during your stay in Peru.